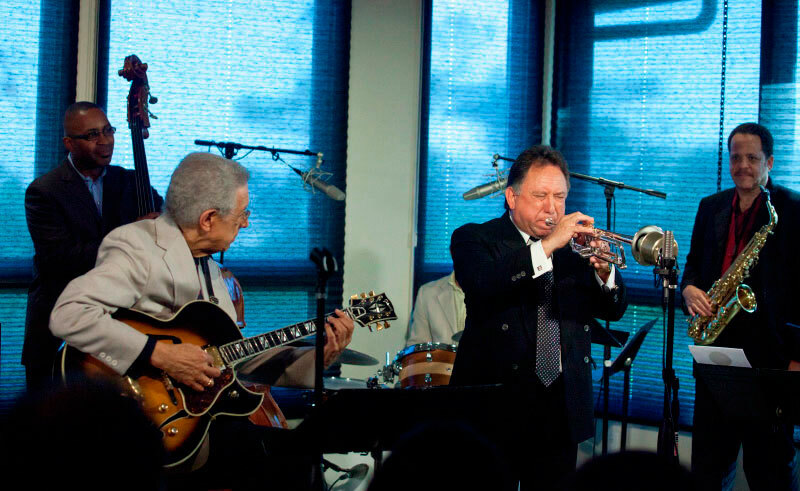 What an amazing experience to have our inaugural show feature Kenny Burrell and the Jazz Heritage All-Stars. 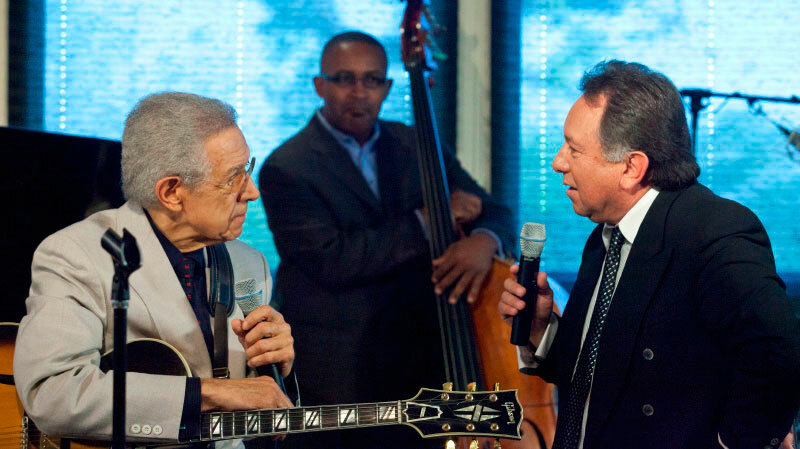 Kenny Burrell – guitar - is the most recorded living Jazz guitarist of all time. He pioneered the guitar-led trio with bass and drums in the late fifties. Although he has since worked in countless other formats, from big band to three guitars plus rhythm to solo, he has remained constant in his quest to get the most out of a natural, low-volume, acoustic sound. "My audience has developed so that they come to listen and are quiet," he explains. "Thus I can work in a limited volume range and explore all the subtleties that can happen, which is my favorite part of the music." Aside from his performing and recording schedule, Kenny is also the founder and director of the Jazz Studies Program at the University of California at Los Angeles (UCLA) where he is a professor of music and ethnomusicology for many years. Included in his teaching schedule is a special course that he developed on the music and life of Duke Ellington called "Ellingtonia". Started in 1978, it was the first regular college course on Ellington taught in the United States. 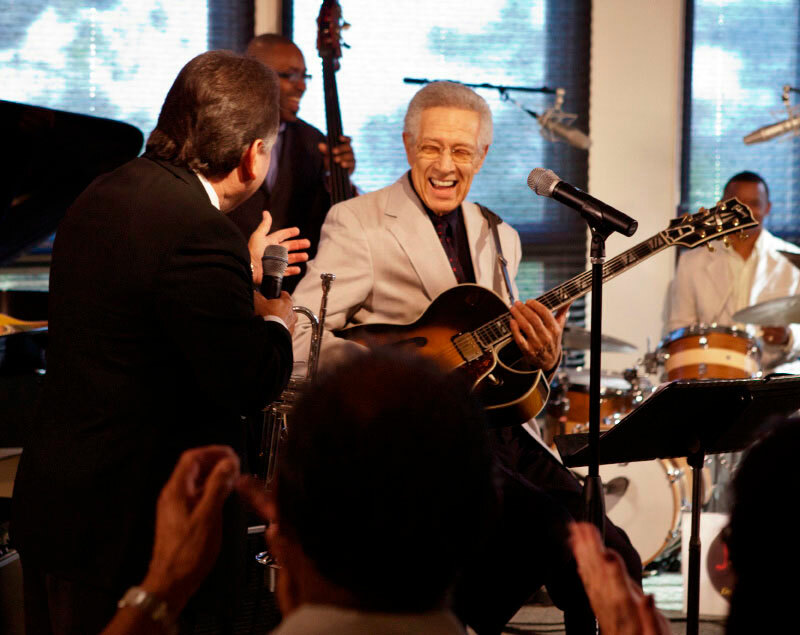 He is also a lecturer and director of workshops on guitar and Jazz studies, founder and President Emeritus, of the Jazz Heritage Foundation, and all around crusader for the recognition of jazz as a classical art form. George Bohanon – trombone - was born in Detroit, Michigan. He began playing trombone at the age of eight. He attended Northwestern High School, Wayne State University, and the Detroit Institute of Musical Arts, where he decided to pursue a career as a musician. Some of his greatest influences were J.J. Johnson, Miles Davis, Charlie Parker, and John Coltrane. Motown Records hired Bohanon as their first trombonist, a position he held for seven years, accompanying artists such as Diana Ross, Marvin Gaye, Smokey Robinson, Stevie Wonder, and many more. In 1968 Bohanon moved to Los Angeles and became very active in the jazz and recording studio scenes. It is no small wonder that the National Association of Recording Arts and Sciences (NARAS) awarded George the "Most Valuable Player" award in 1980. His genius approach to trombone playing creates a lyrical quality which rates high in tone color and dynamics. His evolution as a jazz musician has put him in the company of Kenny Burrell, Yusef Lateef, Barry Harris, and Donald Bird, to name a few. He was also a member of the Chico Hamilton Quintet with Charles Lloyd and Gabor Szabo in the early 1960s. 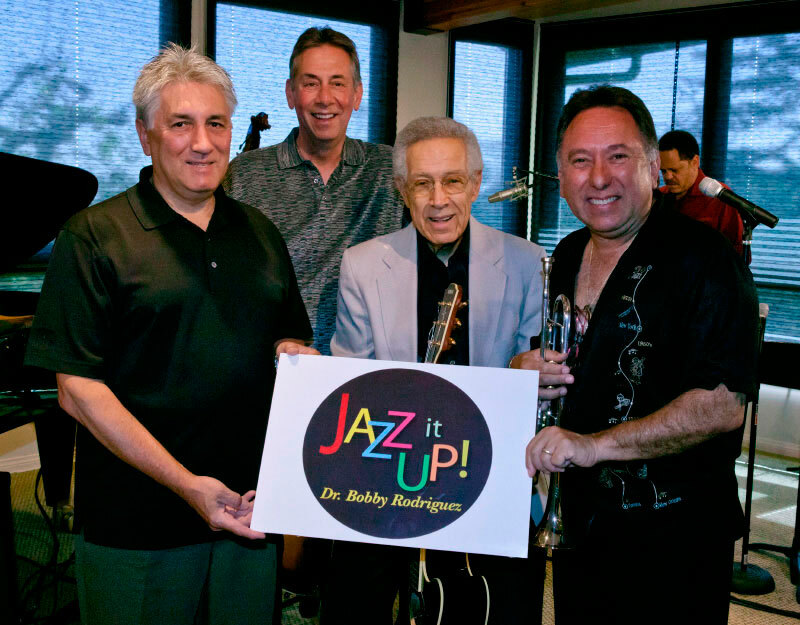 In addition to his position with the UCLA Jazz Studies Program he is also a music contractor, a signatory to the American Federation of Musicians, a music publisher, writer, arranger, producer, clinician, and performer. Justo Almario – tenor saxophone - is a native of Colombia. He went from child protégé to virtuoso. His was primarily influenced by John Coltrane, Cannonball Adderly, Antonio Carlos Jobim, Bartok, Debussy and Bach. He studied at the prestigious Berklee College of Music before joining the Mongo Santamaria group as musical director. He has also taught at the Henry Mancini Institute and has mentored inner city youth during workshops at the World Stage. Currently he teaches saxophone in the Jazz Studies Program at UCLA Herb Alpert School of Music. Randall Willis – alto saxophone - is an extraordinary musician with a unique style that captures the integrity and sultriness of traditional jazz, while projecting the energy and creativeness of contemporary sounds. His diverse talents allow him to not only play the music he is passionate about, but to also compose, write and teach the art. Trevor Ware – bass - is a bassist/composer currently residing in Los Angeles. Over the last several years Trevor has developed a strong reputation as one of the most spirited and supportive jazz bassists in Los Angeles. He is the bassist of choice for notable drummers such as Billy Higgins (the most recorded jazz drummer of all time), Albert "Tootie" Heath (Modern Jazz Quartet), & Clayton Cameron (Tony Bennett). 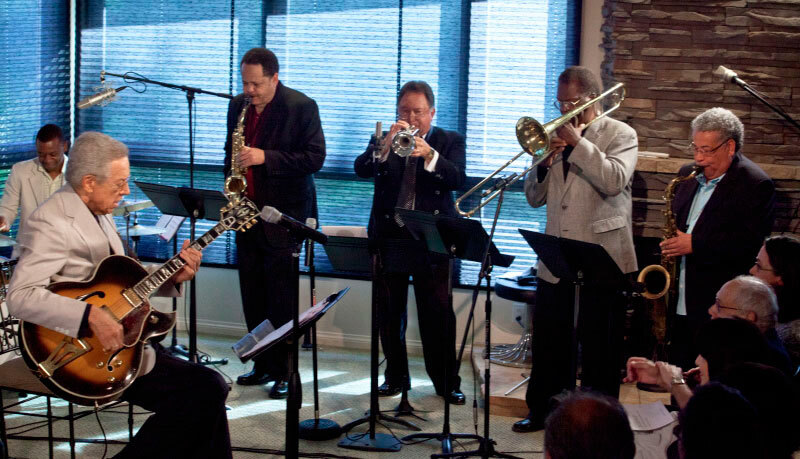 Mr. Ware has performed at the North Sea Jazz Festival with the acclaimed band Build An Ark. His film credits include the Dreamworks film release Collateral starring Tom Cruise and Jamie Fox and the CBS series Smiths starring Ray Liotta. Clayton Cameron – drums - was born in Los Angeles, CA and began playing bongos at the age of seven. By age twelve his fascination with drums became so apparent his parents decided to buy him his first drum set and sent Clayton to music school for drum lessons. “I guess they became tired of my oatmeal box drumming as much as I tired of eating those hearty oats every morning.” Clayton went on to get a degree in music from California State University at Northridge.